La Prisonnière (The Prisoner) picks up where Sodome et Gomorrhe left off, with our narrator Marcel and his partner Albertine now back in Paris, having left Balbec behind. So is this happily ever after? Not quite. Our friend is as jealous as ever, and if he does shower Albertine with gifts, the price she pays for her luxurious lifestyle is a heavy one. Surrounded by spies and forced to reveal every detail of how she spends her days, she is little more than a plaything kept in a gilded cage. This part of the novel isn’t called the prisoner for nothing. Puis, voyant que son sommeil ne serait pas troublé, je m’avançais prudemment, je m’asseyais sur la chaise qui était à côté du lit, puis sur le lit même. J’ai passé de charmants soirs à jouer avec Albertine, mais jamais d’aussi doux que quand je la regardais dormir. Then, seeing that her sleep would not be disturbed, I approached carefully, I sat down on the chair beside the bed, then on the bed itself. I spent many charming evenings in Albertine’s company, but none were as sweet as when I watched her sleep. While she may have private reservations about her life, publicly at least Albertine plays along, perhaps through fear of losing the rich young man’s favour (he might be her best chance of making a successful life for herself). The power games don’t all come from one side of the relationship, however, and there’s a sense that the narrator is being played every bit as much as he is playing her. Despite his desperate efforts to prevent Albertine from seeing women he suspects (probably rightly) of being bad influences (i.e. being lesbians…), he’s fairly naive to place his trust in those around Albertine. He attempts to turn her best friend Andrée into a full-time spy, as well as bribing his chauffeur to keep him up to speed on Albertine’s movements. Yet there’s only so much he can do from his dark room, and there’s a suspicion that they’re all taking his money and deceiving him, laughing at him behind his back. The title of this volume has obvious connotations. The French original uses the feminine form of the word, so naturally the reader is led to connect it to Albertine, but she’s far from the only character in the novel feeling constrained. Morel is caught between his true feelings (both sexual and professional) and his perceived need for Charlus’ social and financial support. Because of his sexual preferences, Charlus himself is forced to lie to friends and society, and while he’s managed to have his way so far, he’s about to suffer a fall after his patronising of the Verdurins backfires spectacularly. As is always the Proustian way, the writing is beautiful, intriguing and mind-numbingly slow in equal parts. It takes the narrator two-hundred pages to get through the first couple of days, and on arriving at the dinner party, when he happens to bump into the Baron on the street, we must endure a further twenty pages before they actually make it into the house. In other ways, though, we’re starting to see some progress in the wider story. Yes, it’s the same old friends and a number of recurring themes (among them, Vinteuil’s ‘petite phrase’ at the salon), but in La Prisonnière, more than in previous parts of the novel, we have the sense of time passing off-stage, with a number of characters (including Swann) having passed on while Marcel and Albertine have been cooped up in their ‘lovenest’. Are you reading it in French? Impressive! I must get back to my translated version sometime. Kaggsy – Yes, and it’s been a long road… However, this one wasn’t too bad, and I’m confident I’ll have it all finished by the end of the year. I thought ISOLT really came alive with S&G, The Captive and the The Fugitive. I still feel that it’s a bit out of character that the narrator keeps Albertine prisoner; sure, he’s obsessive and paranoid but I just don’t see him as a kidnapper and jailer. There is a book putting Albertine’s story of these events called Albertine by Jacqueline Rose — I still haven’t read it. Jonathan – I agree that this one was a welcome change of pace(? ), but not sure I’d agree with S & G 😉 For me, though, the narrator’s behaviour is pretty much what you’d expect given his thoughts throughout the first four parts. If he were really keeping her captive, and she were throwing herself screaming against a bolted door, then no, but this sort of overbearing, psychological ownership is very much par for the course. S&G was probably my favourite volume. 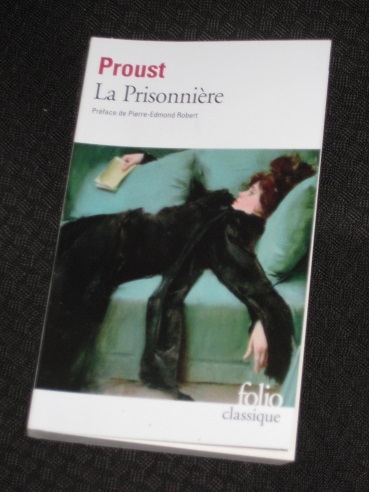 I found Proust’s style was significantly different from this book on; it struck me as more modern. It may have been due to the translation though. It’s also a bit more sinister in this volume and the next. Nice review, and rather inspiring since it’s a bit over a year now since my last installment of Proust. I do like your analysis of the title too. 20 pages to get in the house. That’s certainly Proust.